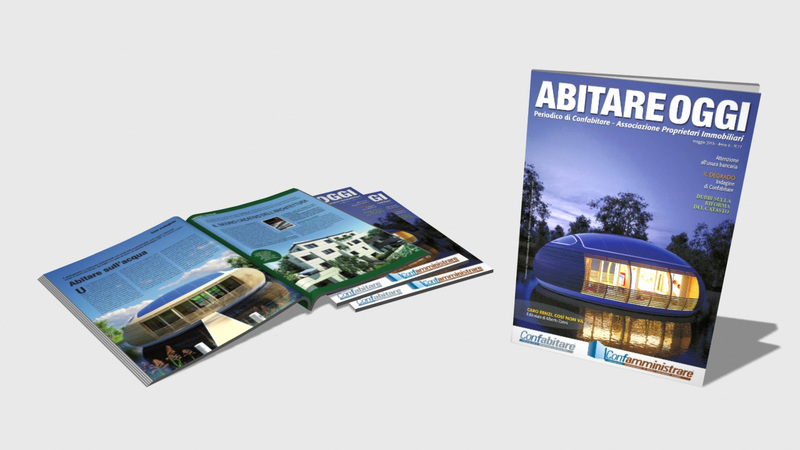 The Italian magazine, Abitare Oggi, devoted a wonderful cover to our WaterNest project and described in an interesting article the potential of the wood market and eco-sustainable architectures. The eco-friendly floating house WaterNest 100, designed by Giancarlo Zema for EcoFloLife is an enveloping of 100 m2 residential unit, 12 m in diameter and 4 m high, made entirely of recycled laminated timber and a recycled aluminium hull. Balconies are conveniently located on the sides and thanks to the large windows, permit enjoyment of fascinating views over the water. Bathroom and kitchen skylights are located on the wooden roof, as well as 60sqm of amorphous photovoltaic panels capable of generating 4 kWp which are used for the internal needs of the residential unit. The interior of WaterNest 100 can include a living room, dining area, bedroom, kitchen and bathroom or have other configurations according to the different housing or working needs. It is perfect like an ecological house, office, lounge bar, restaurant, shop or exhibition floating space.